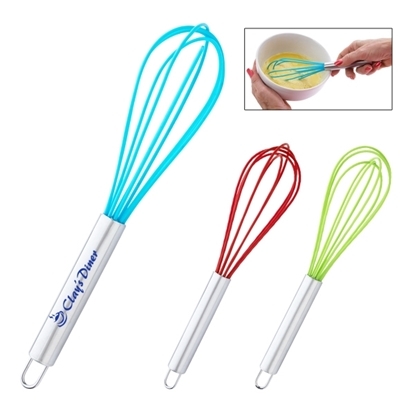 Mix things up in marketing campaign with this colorful whisk! A rubber whisk with a sleek stainless steel handle, it meets FDA requirements and BPA free. 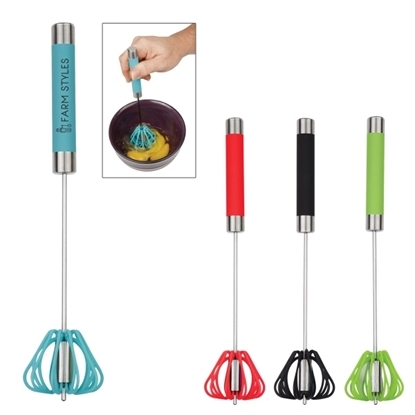 Whisk, mix, and create many meals in the kitchen with a useful tool that stand out with a pop of color. Customize the handle with an imprint of your logo or company name and get your brand in customers' hands at tradeshows, cooking classes, fundraisers, and conventions! Whip together a fantastic promotion using this dart whisk! It features a stainless steel handle with comfortable grip, making cooking more of a joy and less tiresome. It also has spring action technology and rotates, making it easy to use. Just push down on the handle to start mixing! This is BPA free, meets FDA requirements, and we recommend that you clean this by hand washing. Pad print your logo and make clients at your next tradeshow flock to your booth! Mypromotionalpens.com offers the largest and best priced selection in Promotional Whisks. We will price compete and we won't be under sold. Let our graphic designers make your personalized Whisks standout above the crowd at no charge. We won't stop until you are completely satisfied with your custom Whisks art proof.Use category search filters on your left to help narrow your search to find exactly what you are looking for.